Remove any discolored spots and cut out any thick woody stems. Mince the tomato onion and garlic. Lower the heat and cook for 15-20 minutes, or until the greens are tender. When ready, drain the greens, reserving the liquid, and cut them into small pieces. Add tomato and cook for another 4-5 minutes. Add the collard greens, and the reserved liquid and cook, uncovered, until almost dry. 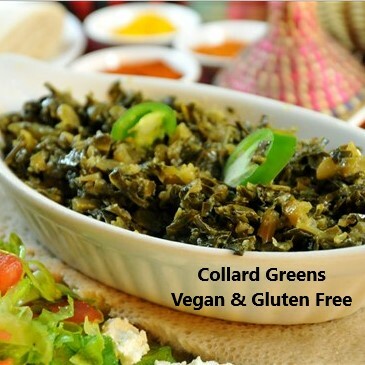 Collard greens is best served with 100% teff - gluten free injera (but it now). or basmatic rice. It also goes well with Misir Wot (Lentils Stew) or Shiro Wot.